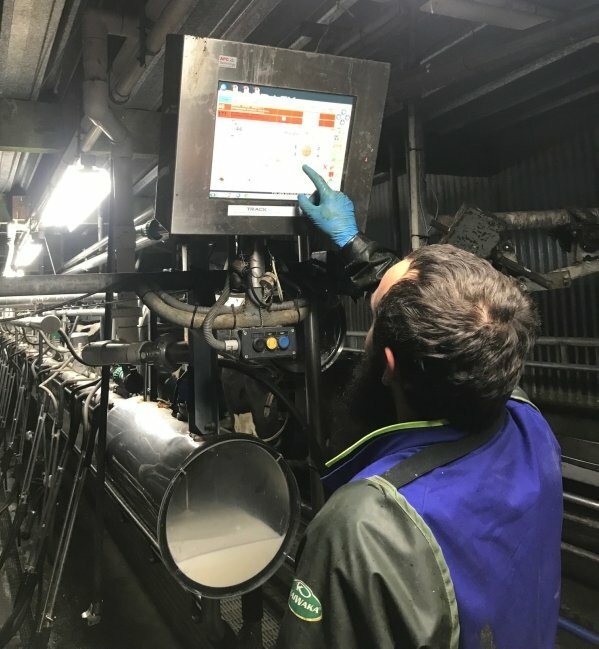 Canterbury farmer Cole Groves is finding simple but effective ways to improve efficiency, accuracy, environmental protection and the wellbeing of his staff and animals. Cole and his wife Virginia run 450 cows as part of an equity partnership on Virginia’s parents’ 120 hectare (ha) dairy farm in Hinds, Mid Canterbury. Cole is also a DairyNZ associate director and National Mastitis Advisory Committee chair. Virginia contributes to the farm, looks after children Hunter (2) and Ebony (4), and runs a part-time business in Geraldine. With such busy lives, it’s not surprising they’ve looked for ways to save time on-farm. The Groves moisture-monitor things regularly and they don’t put fertiliser on when temperatures are low. “Our three-speed effluent irrigators allow us to easily control applications to conditions, targeting paddocks. Even when consented, we often hold off applying effluent after taking our water table levels into account. Cole Groves using Protrack in his Herringbone shed.